NLA - As Genève-Servette HC announces, they have extended their contract with forward Kevin Romy prematurely. Last season's top scorer of the team is now signed until 2017. The 29-year-old center has still a year left on his current contract, but GSHC decided to renew the soon to be Olympian early. Head coach Chris McSorley is happy with the new contract Romy signed: "Kevin is a very popular player among his coaches and teammates, both in the club and the national team. He is the perfect prototype of the exemplary player, exacerbated by his professionalism. It is therefore a great pleasure to work with him daily. In addition, he makes any line better, just by his presence. I must admit that it made me feel a little old, when Kevin returned to Geneva. When he left, he was a young man and athlete in full development, and when he returned, Kevin was a man!" Romy himself declares that it was a decision based on two arguments: "When I left Geneva, I was still in the learning phase. In Lugano, I was able to gain experience and maturity through playing with very good players. Since I have returned to Geneva, I feel really good. The organization is very professional. In addition, the GSHC competes for the title every year. So my choice was easy. This extension allows me to look calmly into the future, also from a family perspective. It was after discussion with my wife, I decided to extend my contract for two more seasons with Geneva. " Kevin Romy has scored 25 points in 30 games for Genève-Servette HC and is currently in his second stint with the team. 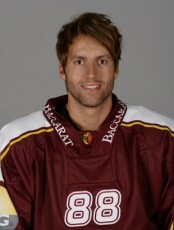 He was already part of GSHC from 2002 until the beginning of the 2005/06 season and then joined HC Lugano. 2012/13 he returned to the team and is now one of its main scorers. He will be part of the 2014 Swiss Olympic Team.